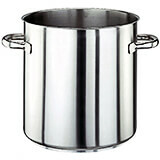 Stainless Steel Stock Pots are very large, deep, straight-sided pots with two side loop handles. Height is equal to pan's diameter and helps minimize evaporation of liquid at the top surface. 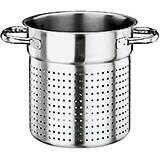 Use for preparing stocks and simmering large quantities of liquids. Suitable for all heat sources and stove tops including induction. Stainless Steel Grand Gourmet #1100 Stock Pot Colander, 11"
11" X 11" X 11.62"
Stainless Steel Grand Gourmet #1100 Stock Pot Colander, 7.87"
7.88" X 7.88" X 8.62"
Stainless Steel Grand Gourmet #1100 Stock Pot Colander, 9.25"
9.25" X 9.25" X 10.5"
19.62" X 19.62" X 19.62"
12.5" X 12.5" X 12.5"
14.12" X 14.12" X 14.12"
7.88" X 7.88" X 7.88"
The 103 1/2 quart stainless steel stock pot, with its tri-metal bottom, is used most commonly for simmering. It is ideal for making soup, as the equal lengths of its diameter and height limit evaporation. It is induction compatible. No Lid.Material: Stainless Steel.Capacity: 103 Qt. The 11 quart stainless steel stock pot, with its tri-metal bottom, is used most commonly for simmering. It is ideal for making soup, as the equal lengths of its diameter and height limit evaporation. It is induction compatible. No Lid.Material: Stainless Steel.Capacity: 11 Qt. 23.62" X 23.62" X 21.12"
This Paderno World Cuisine stainless steel stock pot (without lid) can hold 158 1/2 quarts. This stock pot has welded handles. The stainless steel stock pot, with its tri-metal bottom, is used most commonly for simmering. It is ideal for making soup, as the equal lengths of its diameter and height limit evaporation. It is induction compatible. No Lid.Material: Stainless Steel.Capacity: 158 Qt. The 18 quart stainless steel stock pot, with its tri-metal bottom, is used most commonly for simmering. It is ideal for making soup, as the equal lengths of its diameter and height limit evaporation. It is induction compatible. No Lid.Material: Stainless Steel.Capacity: 18 Qt. The 27 quart stainless steel stock pot, with its tri-metal bottom, is used most commonly for simmering. It is ideal for making soup, as the equal lengths of its diameter and height limit evaporation. It is induction compatible. No LidMaterial: Stainless Steel.Capacity: 27 Qt. The 3 3/8 quart stainless steel stock pot, with its tri-metal bottom, is used most commonly for simmering. It is ideal for making soup, as the equal lengths of its diameter and height limit evaporation. It is induction compatible. No Lid.Material: Stainless Steel.Capacity: 3.37 Qt. The 38 1/2 quart stainless steel stock pot, with its tri-metal bottom, is used most commonly for simmering. It is ideal for making soup, as the equal lengths of its diameter and height limit evaporation. It is induction compatible. No Lid.Material: Stainless Steel.Capacity: 38.5 Qt. 7.12" X 7.12" X 7.12"
The 4 1/4 quart stainless steel stock pot, with its tri-metal bottom, is used most commonly for simmering. It is ideal for making soup, as the equal lengths of its diameter and height limit evaporation. It is induction compatible. No Lid.Material: Stainless Steel.Capacity: 4.25 Qt. The 5 3/4 quart stainless steel stock pot, with its tri-metal bottom, is used most commonly for simmering. It is ideal for making soup, as the equal lengths of its diameter and height limit evaporation. It is induction compatible. No Lid.Material: Stainless Steel.Capacity: 5.75 Qt. The 52 1/2 quart stainless steel stock pot, with its tri-metal bottom, is used most commonly for simmering. It is ideal for making soup, as the equal lengths of its diameter and height limit evaporation. It is induction compatible. No Lid.Material: Stainless Steel.Capacity: 52.37 Qt. The 67 quart stainless steel stock pot, with its tri-metal bottom, is used most commonly for simmering. It is ideal for making soup, as the equal lengths of its diameter and height limit evaporation. It is induction compatible. No Lid.Material: Stainless Steel.Capacity: 67 Qt. 8.62" X 8.62" X 8.62"
The 8.3 quart stainless steel stock pot, with its tri-metal bottom, is used most commonly for simmering. It is ideal for making soup, as the equal lengths of its diameter and height limit evaporation. It is induction compatible. 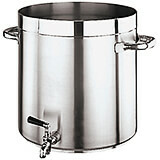 No Lid.Material: Stainless Steel.Capacity: 8.75 Qt. 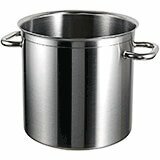 Stainless Steel, 18/10 Steel Profiserie Stock Pot, 11.1 Qt. The professional's choice worldwide with reinforced curved edge for non-drip pouring. 18/10 stainless steel with matte finish. Extra thick aluminum disk sandwiched between stainless steel ensures even heat distribution. Tubular stay cool handles. Designed for commercial use or any stove-top including induction. NSF certified. Safe for stovetop, oven, freezer and dishwasher. Made in France. Stainless Steel, Excellence Stock Pot With Lid And Faucet, 11.5 Qt. Stainless Steel, Excellence Stock Pot With Lid And Faucet, 18 Qt. Stainless Steel, Excellence Stock Pot With Lid And Faucet, 26 Qt. Stainless Steel, Excellence Stock Pot With Lid And Faucet, 38 Qt. Stainless Steel, Excellence Stock Pot With Lid And Faucet, 53 Qt. 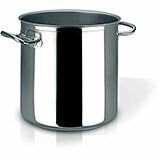 Stainless Steel, Excellence Stock Pot Without Lid, 11.5 Qt. 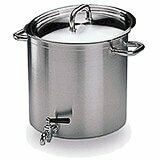 Stainless Steel, Excellence Stock Pot Without Lid, 18 Qt. 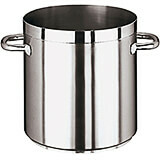 Stainless Steel, Excellence Stock Pot Without Lid, 26 Qt. Stainless Steel, Excellence Stock Pot Without Lid, 38 Qt. Stainless Steel, Excellence Stock Pot Without Lid, 53 Qt.